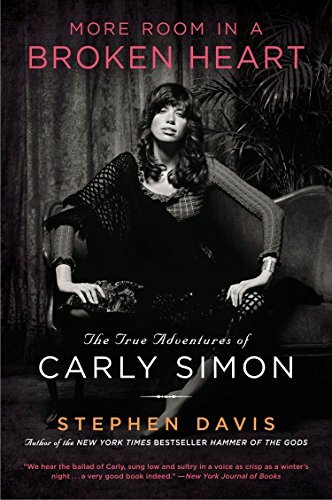 Author Stephen Davis was an ideal choice to write an in-depth biography of singer/songwriter Carly Simon for two reasons. First, in having already written biographies on The Rolling Stones (Mick Jagger will, of course, figure strongly in these pages as well), Levon Helm, Aerosmith and others, he has already shown himself to be knowledgeable in terms of era, art form and geography. He has written his way all around Carly Simon, so it seems fitting that she should be his topic this time out. “I’ve followed Carly’s career, first as a fan, then as a journalist. I watched her struggle with career and family issues until she launched her run for the rainbow in 1970 with her first solo album. The next year I reviewed her triumphant second album for Rolling Stone. I went to those early concerts where she opened for star-quality singer-songwriters such as Cat Stevens and Kris Kristofferson as she honed her own songwriting skills. I was one of the first people to hear (In Carly’s bathroom) the early mixes of “You’re So Vain,” which Carly had brought back from London, with Mick Jagger’s uncredited—and unmistakable—backing vocal on the choruses. The single spent three weeks at number one. The album spent five weeks at the top. Suddenly Carly Simon was one of the booming music industry’s most talented and glamorous artists. Excellent thumbnail, both of the author’s relationship to his subject and of the materials covered in the book itself. To read More Room in a Broken Heart is not only to be reminded of the contributions that Carly Simon and James Taylor have both made to our musical culture, but it is also to be wonderfully, nostalgically reminded of how fertile that time was, in the late sixties through the late seventies, when so many giants of the industry were at the top of their games. Mr. Davis recreates the era with the ease of one who lived it, detailing not only the creation of the material, the songs themselves, but the creativity of the sessions on which the music was captured and recorded. If there is one emotion that seems to come attached to the creation of new music with Simon and company, that emotion is joy, which leaps off the page every time that Carole King shows up, happy to jump in a play piano or sing back-up, along with assorted members of the Simon and Taylor families or when a gaggle of luminaries including the incendiary Bonnie Bramlett are actually hired, along with the best musicians in the business to lend their talents to back-up. And so, with More Room in a Broken Heart, we hear the ballad of Carly, sung long and sultry, in a voice as crisp as a winter’s night. Stephen Davis works hard to give us the whole of her story, the ups and the downs, and makes sure, in his telling of it, that she does not emerge simply as sainted. And truly, the portrait of Carly Simon that emerges is one of a complex, even difficult person, one who bends herself over backward in coping with her demons (stage fright that would more truthfully be called “stage terror,” various fears that consistently hurt her career, including a fear of flying and a certain hypochondria—migraines, exhaustion, etc. all keyed to explode at the worst possible moment—and an inflexibility of character that the fears and phobias created. She is also seen as a deeply caring and emotionally supportive being, whose extraordinary support of her husband James Taylor through he various bouts with various drugs seems exemplary. Further, she is shown as an intelligent, thoughtful, and generous person, and certainly one of the most talented of her generation. To say that More Room in a Broken Heart is a warts-and-all biography may be overstating the case, given the author’s apparent affection for Ms. Simon. Blemishes-and-all may more clearly define this work. And yet the image of Carly Simon that emerges here is one of a fully rounded and fascinating human being, one who, blemishes and all, seems well worth knowing. “Summer 1982. Carly took a call from her old flame Willie Donaldson in London. Willie, now sixty-two, was a bestselling author in England (The Henry Root Letters) and a columnist for The Independent newspaper . . . Willie told Carly that the paper was sending him to New York to cover a benefit at the Ritz nightclub starring Elizabeth Taylor and the hip-hop group Salt-N-Pepa. Willie invited Carly along as his date. In short, More Room in a Broken Heart is a very good book indeed. Which is not to say that the reader does not come away with a few small irritants to report. First, there is the matter of that title. The reader wonders why, in a book in which so many chapters are named with wry references to our singer-songwriters best known works as well as plays on her famous first husband’s (chapters called things like “Son of a Gun,” “Hotcakes,” “Rain and Fire,” and “Why’d You Tell Me This?”), the title of the whole book is merely a line taken from “Coming Around Again,” the theme that Simon created for the movie Heartburn? That rather morose line a downer of a title makes. It seems to suggest that our tale is one of heartbreak and defeat, rather than the moving, entertaining and, in a very real way, triumphant tale told here. Mr. Davis not only tells the story of Carly Simon’s life that we have all long known—her failed marriage to Taylor; her privileged childhood as the daughter of founder of the publishing house Simon & Schuster, Richard Simon; and her own extraordinary career, which brought her a couple Grammies, a Golden Globe and an Academy Award (for her song, “Let the River Run,” from the film Working Girl), among others—but reveals many details of her childhood, along with the details of her troubled second marriage and of her struggle with breast cancer—that have, heretofore, not been revealed. Such a good biography deserves a good title. Would that this one would have suggested that there was more to Carly Simon’s life than a broken heart. One last quibble: When has a major biography of a major celebrity that weighs in at 432 pages comes into the reader’s hands without an index? And why would the publishing world choose to start with such a sad method (apparently) of cost-cutting now? With this particular book? With such a great story told including such an incredible cast of characters, in anecdotes happy and sad (the implied rivalry—both in terms of careers and personal relationships, especially, at one point for the affections of James Taylor—between Carly Simon and Joni Mitchell is worthy of a book of its own) and often very, very funny, Stephen Davis being a master of the well told anecdote? Still, the book contains a treasure trove of photographs, many of which were taken by Simon’s photographer brother Peter. But for this reader, nothing replaces a nice, fat index in a celebrity book like this.